Let’s face it, Bangkok doesn’t have a reputation for being a particularly green city. Undeniably, it has its positives as a city – the food, the shopping, the nightlife (though even that becomes questionable as to whether the negatives outweigh the positives) – but if there is one image that lingers of Bangkok in most travellers’ minds, and indeed defines it in their minds before they’ve even arrived, it’s a grey one: of noise, of traffic and of pollution. This has indeed been my overwhelming view of Bangkok on the dozen or more times I’ve visited over the last two and a bit years, and I am not known for being a massive fan of the capital – I quite frequently tell people, who are invariably from elsewhere in Thailand and tend to agree, that I can quite happily hack a couple of days there after arrival in or prior to departure from Thailand, but that I am always rather glad to see the back of it, as I make my way to some place slightly less crowded and chaotic; and somewhere a little greener. But even Bangkok has its own secret stash of greenery in public parks which had until now, to me at least, remained undiscovered. On Thursday, a day into my latest jaunt around south-east Asia, after a meander around the streets of Banglamphu I made a point of escaping the throngs of tourists and headed to Lumpini Park. And I’m glad I did. What awaited me was not what I expected. When you say the word park to me, I imagine somewhere rather untamed – not wild, like an overgrown field, but not perfectly manicured either. Lumpini, though by no stretch Kew Gardens or the you-can’t-walk-on-it-so-what’s-the-point-of-having-it-in-the-first-place grass at Hampton Court Palace, is not untamed. It has roads running through it (though these are seemingly only used by pedestrians anyway) and a lake which seems to use a mechanical pump to get water in and out via the drains in the street. What’s nice about it, though, is that it gives Bangkok, and more importantly its residents, a bit of peace and serenity in an otherwise permanently frantic city. It seems to attract fitness freaks – most of the weary-looking souls resting on the lake’s banks after a long day in the office managed to find time not just to lay and relax, but also to work in a few stretches at the very least – but above all else it is a place for everyone: from families with children playing on the bridge, to joggers and badminton players of all ages, to the hundreds of nutters turning out for high-volume morning and evening aerobics classes (most hilarious were the three or four old folks, who’d started their own little class on the other side of the park from the two bigger groups – and who had the loudest music of the lot). Even Bangkok’s reptiles call Lumpini home, though several frantic Facebook and Twitter updates later I’m assured (by another Bangkok-dismissive friend, this one from Ayutthaya) that what inched its way down the grassy bank next to me and back into the water was in fact a lizard and not, as I had thought, a crocodile or alligator (who knows which one I thought it was – a Google search for ‘crocodile vs. alligator’ pulls up all sorts of advice about spotting differences which involve opening the thing’s mouth, which I’m not planning on doing any time soon!) All I’ll say is it was a damn big lizard. I’ve not spent nearly enough time in the sprawling, disorientating metropolis that is Bangkok to know its character any more than skin deep; I’ve barely set foot out of Banglamphu and Silom. 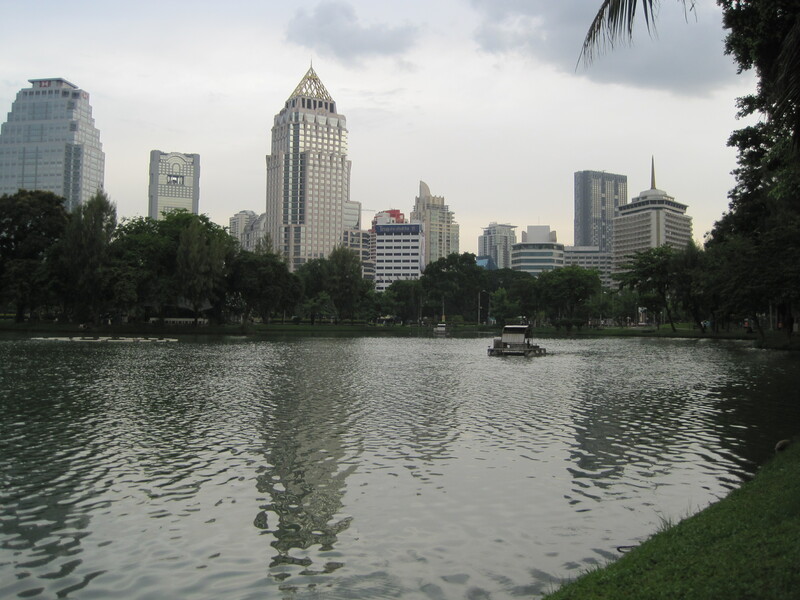 But the tranquillity of Lumpini Park, in dire contrast to the rest of the ‘city of angels’, makes me think that until you’ve experienced Bangkok’s more laid-back vibes, you’ve not really got a flavour of the city as a whole. And if nothing else convinces you to give it a go the next time you’re there with time on your hands, it’s the one place I’ve found so far where you can reduce the noise of the traffic to a mere roar – if, that is, you stand perfectly in the middle with cotton wool in your ears.